Cook macaroni according to package directions; drain and rinse with cold water. Cool completely. For dressing, in a small bowl, combine the mayonnaise, pickle relish, sugar substitute, mustard, salt and pepper. 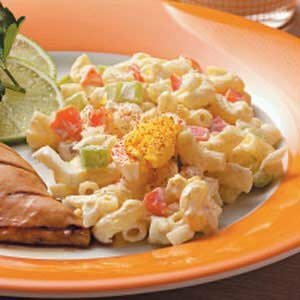 In a large bowl, combine the macaroni, celery, carrot and onion. Add dressing and toss gently to coat. Refrigerate until serving. Garnish with egg and paprika. Makes 8 servings.